Just 3 houses from the Beach, this 3 bedroom, 2 bath cottage with open concept floor plan, and private patio and bath @ Queen bedroom includes ceiling fans throughout, 2 screened porches, 3 Cable TVs (1 a Wide screen Smart TV), WD, MW, DW, DVD, Grill, WIFI/DSL, unlimited LD phone calls, POOL PRIVILEGES @ DAYS INN. Beds: 1 King, 1 Queen, 2 Doubles. Accommodates 8. NO PETS, NO SMOKING. 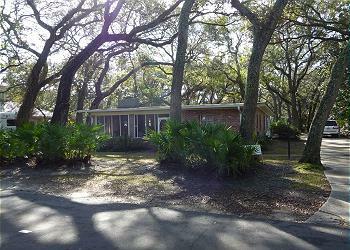 Bliss Your Heart Cottage, was the 3rd home built in the First Planned Community on Jekyll Island. It is located "Under the Oaks". Original architectural features remain, including raised beam ceilings, and pineboard & brick walls . It is updated and styled in keeping with the charm & natural ambiance of Jekyll Island. We had a good time visiting with friends, exploring the island and getting out on the beach and golf courses. My wife and sai stayed here with our son and our parents and it worked out great. Very nice layout of the house, very happy with the kitchen and all the ease to just come back to the house and chill. We have stayed in this cottage a number of times over the years. We love it's layout and close access to the beach. I will note that the furniture and kitchen furnishings are aging and some need replacement but this is still a very nice "blissful" place to stay. The rental process is easy and everything went according to Hoyle. Will stay here again. The house was a great size. We loved the openness of the kitchen dining great room are. Our family loves to play games, work puzzles etc while vacationing and there were lots of different areas to enjoy those activities as well as spend time at the beach nearby. Only one small issue with the house was the step up into the kitchen from the bedroom/bath and laundry room area. We were grateful for the available handle to help negotiate the step, but we did have a few mishaps with family members tripping on the step a few times. Overall we had a fantastic time that week and wish it could have been longer. Bliss is a very comfortable cottage. Although it is one of the original houses built on Jekyll, it has recently been remodeled keeping some of the charm of original cottage. The living space and the bedrooms were good sized. Huge oak trees overhang the street making it cool and shaded. The beach is a short walk and even at high tide, we always had room for our tent and chairs. We would certainly rent it again. The people at Jekyll realty were very professional and helpful. We had beautiful weather. The fireworks were amazing. It was a wonderful week. This is a house we have often rented in the past 20 years. It's a comfortable family home, definitely not fancy, but great for kids. There is a nice yard and two screened porches.People who are looking for a luxury rental would not be happy. We, along with our children and grandchildren think it's a great vacation house. Great location also. We were down for my nieces wedding.loved the location,very homey and lots of room. I love the peace and tranquility of jekyll island. Bliss Your Heart has a great location. Close to beach. Home was clean and well cared for. Had to vacate the home a day early due to hurricane Irma. Very peaceful cottage and location. Cottage has been updated some since last year with a screened in patio (previously a carport) and new den furniture. 100 yard walk to uncrowded beach. Our favorite vacation spot by far. improve it. I have been impressed with the service offered by Jekyll Realty-even for small problems they are there immediately. John & Margaret Mary L.
We thoroughly enjoyed our month at Jekyll Island again.